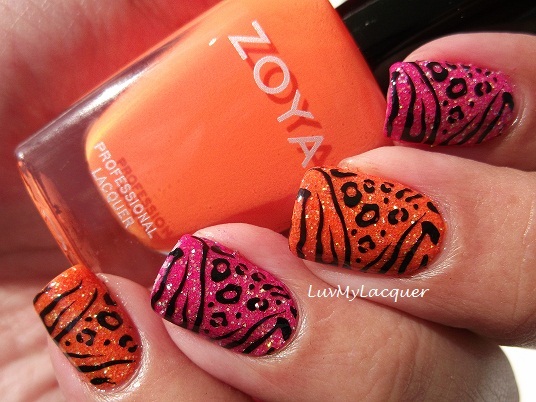 LuvMyLacquer: On trend with Zoya neons and animal print! 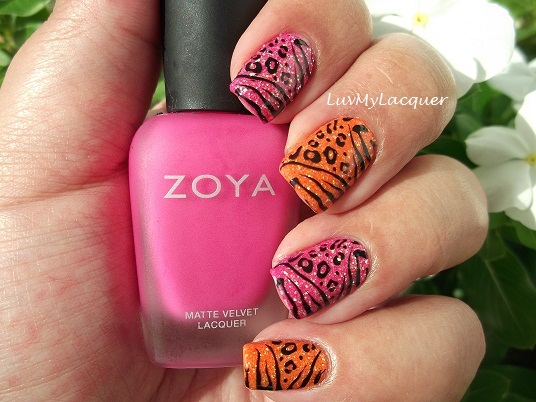 On trend with Zoya neons and animal print! Hello Lacquer Luvers! Before I even begin, I just wanna say I LOOOVE my nails today! The pictures really do speak for themselves but of course I will share with you all how this look was achieved. Once my polish dried, I applied matching color glitter to my nails. I did this one nail at a time and used FantaSea Cosmetics Nail Glitter in orange and pink (the sticker on the bottom of my pink jar fell off). A coat of Color Club top coat was applied first, then I used a false nail tip as a scoop for the glitter. I sprinkled it onto the wet clear polish and tapped off the excess. After that set, it was time for me to get funky! But first I had to add 3 coats (I know, I know - sooo time consuming but totally worth it) of the Color Club top coat to smooth out my surface because stamping won't work on loose glitter. So, once my 3 coats dried, I got out my Konad M78 image plate and Special Stamping Polish in black and put this awesome zebra/leopard design on my nails. This manicure was topped off with a coat of Color Club's top coat. As I've already said, I LOOOVE this mani! It is so summery and fun and was perfect for today since it was 88 degrees here and I had a blast at the park with my son. The only thing I didn't like about this was how time consuming it was with trying to get a smooth surface before stamping. I definitely need to get to Sally's and pick up a bottle of Gelous which I'm sure will cut down the time. Please, let me know what you think of this mani below. 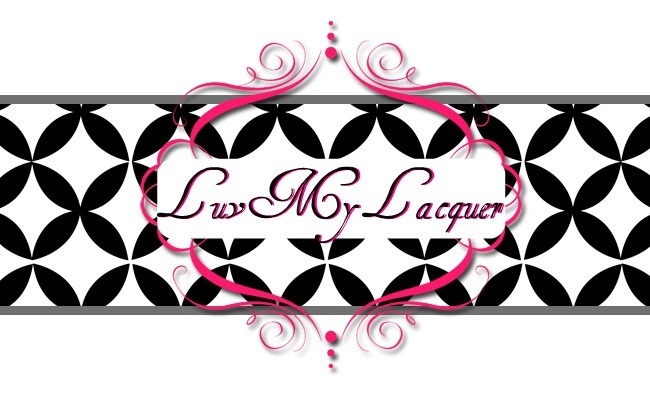 As always, I hope you all liked this post my dear Lacquer Luvers and I look forward to sharing my next post with you, xo! OMFG!!! this is absolutly gorgeous!! This is so gorgeous! I need to get a konad! Wow, so worth the effort! Love this! The colors are FABULOUS, I LOVE the glitter and I just ADORE the way it looks with the stamp!! I absolutely love love love this! Your manis are always gorgeous and this is no exception!! Definitely worth that it's time consuming... the result is gorgeous!! *O* oh my goodness, i am SO in love with this!!! INCREDIBLE! 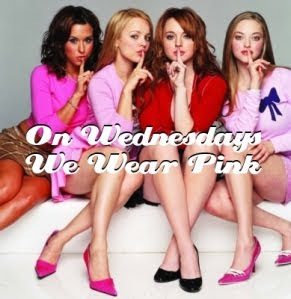 This is so fabulous! I love the sparkles and the colors and the animal print. It's all great! Beautiful! You've done well Jess!!! Gelous will cut down on the many coats... but this is so gorgeous!! I love reading that you use color club topcoat! yay!! Very nice! What's your Special Stamping Polish?? Check Out My Guest Posts! 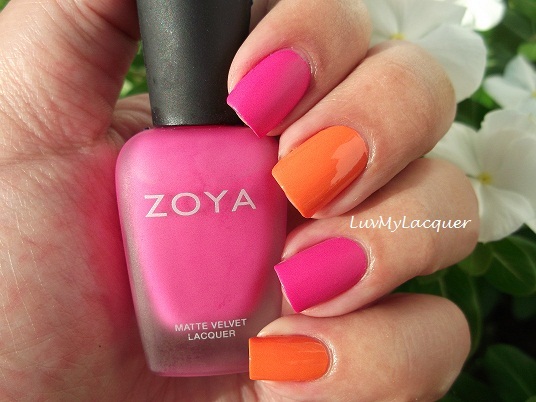 A Yummy Zoya Jelly Sammich!